Kerry Tribe, Milton Torres Sees a Ghost (detail), 2010, audio tape, two reel-to-reel players, oscilloscopes, framed documents, dimensions variable. Kerry Tribe’s work deploys technology and archives in unusual ways to investigate memory, particularly how time structures our lives and remembrances. Tribe does not use gadgets gratuitously––she enhances the viewing experience by constructing a phenomenological encounter. Milton Torres Sees a Ghost (all works cited, 2010) is designed to unfold during one’s encounter with it. 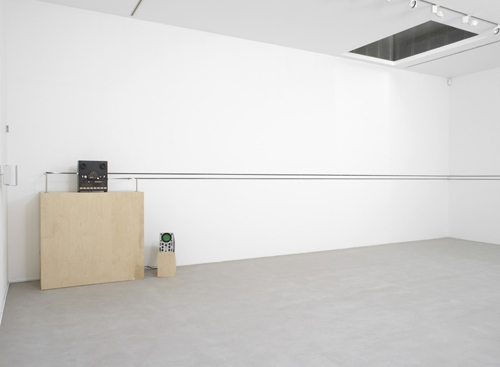 A horizontal ribbon of magnetic tape is elegantly extended across the wall and anchored on two ends––about seventy feet apart––by two reel-to-reel machines. Walking alongside it, one begins to hear from the tape player’s speakers (at the far end of the gallery) the craggy voice of an elderly man named Milton Torres as he reminiscences about a 1957 incident in which, as a fighter pilot, he was given top-secret orders to attack a UFO. Originally his story was suppressed by the British military. Two oscilloscopes extend the metaphor of generation and erasure of Torres’s story, and through their technical dance (the flat line on one end of the circuit versus the dancing EKG-like line capturing each syllable at the other end), Tribe sets up a process that is reflective of Torres’s unreliable and receding memory. The circuitous nature of Milton Torres Sees a Ghost resonates with the Möbius strip of 16-mm film suspended above a projector in Parnassius Mnemosyne. The film depicts a magnified butterfly wing, which appears on a screen as indistinguishable abstract patterns. The wing, and the title of the work, evokes Vladimir Nabokov’s drawings of butterflies, some of which were published in the endpapers of his memoir, Speak, Memory (1951), a book that he originally intended to title Speak, Mnemosyne. By using rigorously crafted technology, Tribe emphasizes process and the structure of memories in order to reflect the uncertainty and malleability of what has happened and how we remember it.